Groundbreaking: The Arts & Innovation Hub Begins! 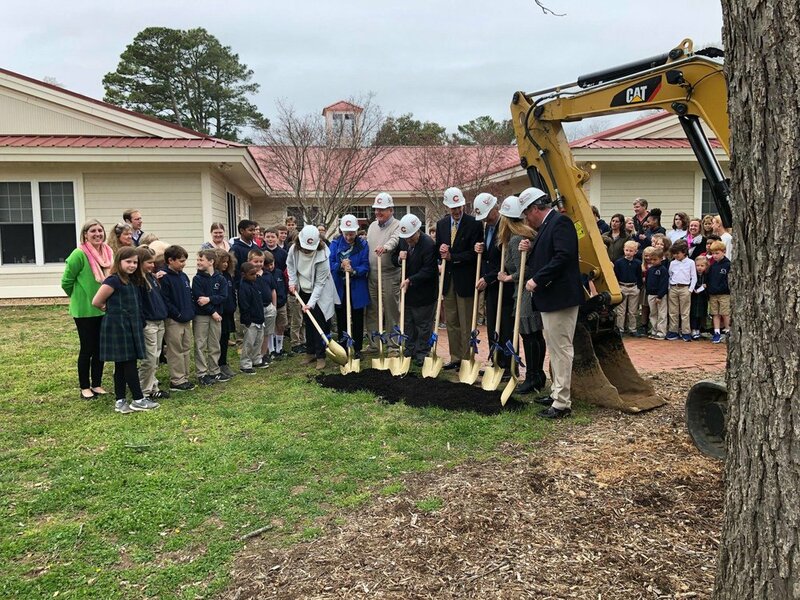 With a little fanfare and abundant infectious enthusiasm, Chesapeake Academy broke ground on a dynamic Arts & Innovation (A&I) Hub in memory of Dianne Chase Monroe at the center of Chesapeake Hall on the Rowe Campus in Irvington. This A&I Hub, designed by Randall Kipp Architecture, will house the new James Library, cutting-edge innovation and design lab spaces, and a production studio, providing flexible, convertible, and expandable spaces for multiple uses now and in the future. This vital, central space in the school will reflect Chesapeake Academy's focus on the deep academic development for students involved in design and innovation. "Chesapeake Academy continually grapples with the question of how best to prepare students for a constantly changing future. We know that focusing too much on recall and test taking does not adequately develop basic competencies or authentic life skills," Head of School Julianne Duvall explains. "Chesapeake Academy systematically embeds critical thinking across the curriculum. Instead of teaching a catalog of facts, each grade and subject address larger essential questions designed to inspire critical inquiry and broader connections. Project-based learning taps into student passions, igniting curiosity and driving learning deeper. We are now ready to move forward on new opportunities for our students in innovation and design." The new A&I Hub will house technological equipment, such as a 3D printer, robotics, and laser cutter, along with power and hand tools. In addition, a broadcasting studio for video and audio, plus arts and design supplies, will live side by side with software design tools such as Adobe Creator. "We embrace design learning at Chesapeake Academy because we believe that it will benefit our students, increasing student motivation, developing resilience, and promoting deeper learning. If school serves to prepare children for life, it should look more like life and be filled with challenges and opportunities that truly build a wide variety of authentic skills," concludes Julianne Duvall. Using seed money from lead donors, the plans for the project began in 2017. A one-to-one challenge grant from The Mary Morton Parsons Foundation, along with enthusiastic donations from the school and broader communities, moved the project from design to implementation. "We are delighted by this opportunity to offer Chesapeake Academy students all the advantages of a cutting edge education right here in our unique rural community. Innovation and design are integral to developing the flexible, critical thinkers who will lead in the future," explains Head of School Duvall. "This Arts & Innovation Hub is the outgrowth of rigorous research, extensive faculty development and collaboration, and the generosity of donors who can feel the passion behind this project. We are proud to name this exciting space for friend of the school Dianne Chase Monroe. Students gather to witness the ground breaking. A very special day at CA!